St. Patrick’s Day–Lá Fhéile Pádraig or just Paddy’s Day—is long gone, but there’s still time to get one of this year’s incredible offerings. I know they’ve been out since about mid-February, but I’m still seeing some basic questions about them, so I thought I’d put my oar in the water and say if you haven’t seen them—or added one to your Pete collection—you’re missing out on the single best year of this series since it began in 1998, hands down. In working on the Peterson book, by the way, we were able to document that the series did indeed begin in 1998—which is what most Pete Nuts have speculated—but still, it’s nice to be able to verify it. That first year’s issue featured an Irish flag tri-color acrylic band, which I’ve heard some people complain didn’t wear very well. 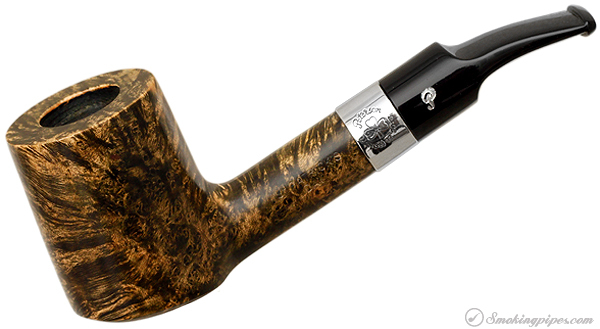 IPPC’s Phil Blumenthal has a good overview of the series which can be at http://btheinternationalpetersonpipeclub.runboard.com/t86,offset=10. As his photos demonstrate, the series has had its ups and downs and in-betweens (I’ll let you decide which was which). After the first stellar year, many years of the series have simply issued Classic Lines shapes in the familiar semi-matt brown finish we see on the current Aran series, a few venturing into green matt and red/brown matt stains. 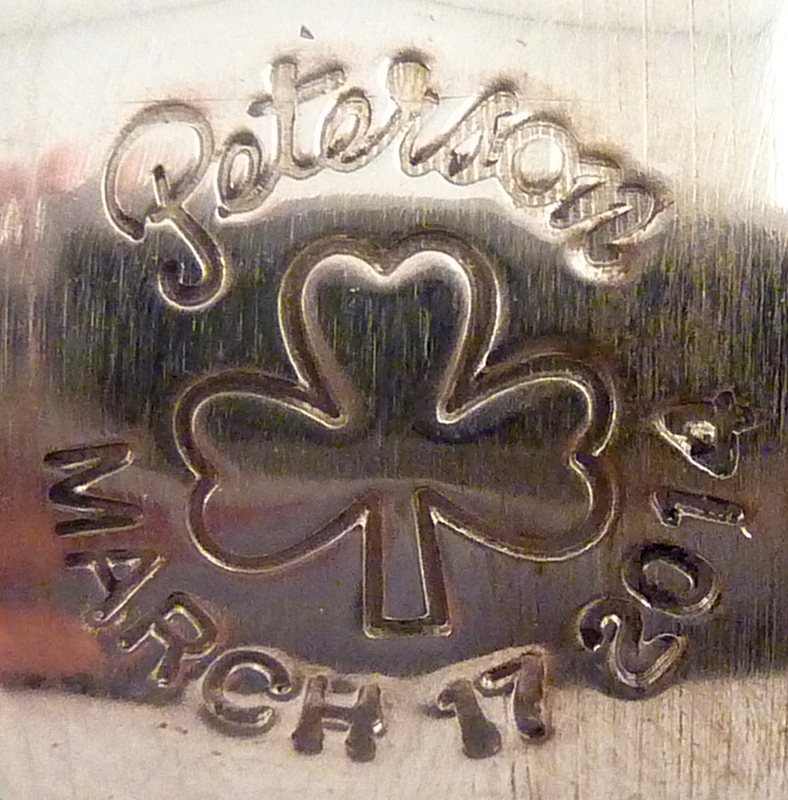 By 2000 the familiar nickel band with the shamrock wreathed by “Peterson—March 17, 20–” appeared, which has been used ever since. What I finally learned, mostly by failing to pull the trigger at the right moment, is that the magic of this series has two components: the first is waiting to see the finish. Most years haven’t impressed me a lot, although 2013’s was stellar with its matt smoky walnut contrast stain. As the B58 above (originally from the Iceberg Collection) so forcefully suggests, the second bit of magic in the series is what I wait for: what rare shapes will Peterson trickle down from its special editions and series? As early as 2000, the 1903 bowl from the original Antique Reproduction set, which came out in 1996, was issued. 2002’s D7—another no longer produced shape—was another highlight. 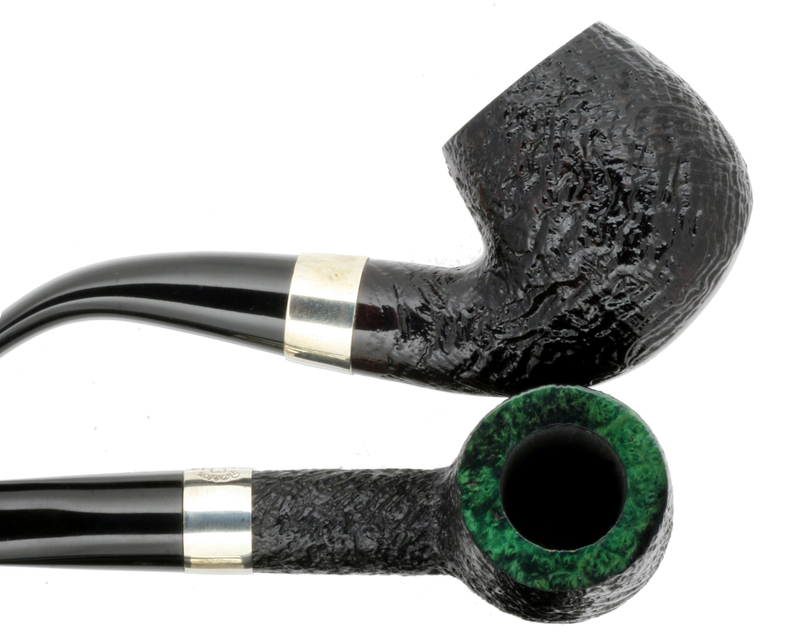 Most years there’s something special, whether it’s something from the Sherlock Holmes series (2001, 2012) or the last hoorah of the B2, which was originally the Limited Edition / POY shape for 2002, or the Iceberg shapes from last year. 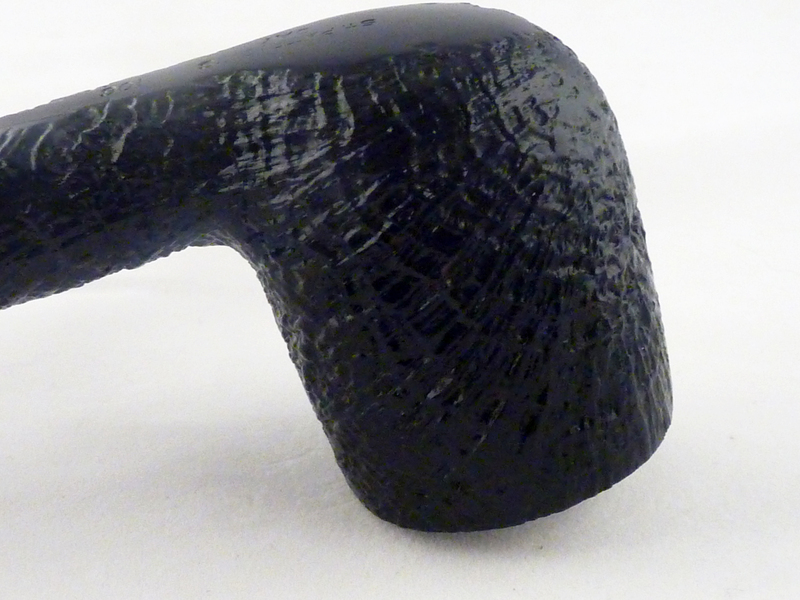 So what’s remarkable about the 2014 pipes isn’t a special shape that been allowed to trickle into the series, but the incredible blast and dual color finish: a variable, random blast in what one of the fellows at IPPC calls “Trinity pitch black sandblast and polished rim.” The blast is very liquid: it reminds me in fact of the slow-moving ripples across the water of the River Ennis just at twilight when we were there a few years back. The green is such a perfect complement it took me several minutes and an Ott Light to believe the black bowl wasn’t midnight green. It’s a great finish and a great combination. 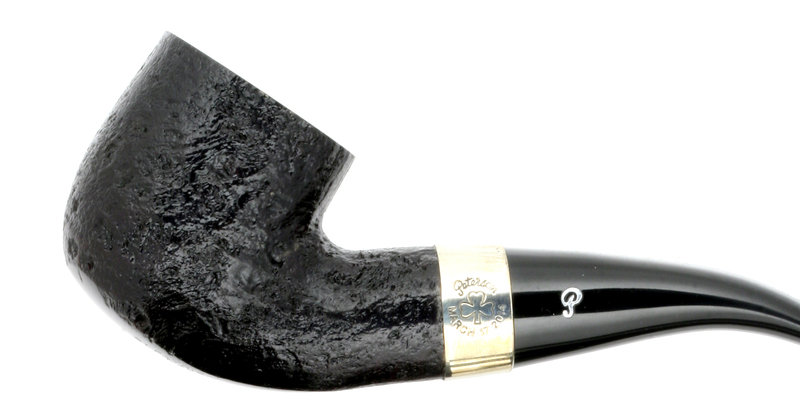 And if there’s no exotic shapes for 2014, notice (if you will) what Peterson’s done to the traditional shapes, because there’s just a little something new here: the smooth foot on the bowls. That’s right, they’ve smoothed the bottom of all the bowls. 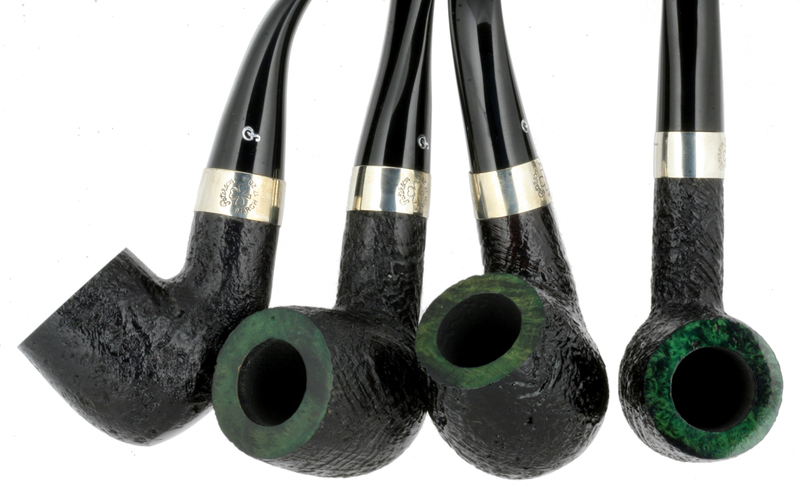 In some cases, this doesn’t seem to make much difference, but in the 01 Pot, the 106 Billiard, the 68 Brandy and the 105 Billiard the effect is to shorten the height of the bowls without changing the tobacco chamber, since the extra wood is taken off the bottoms, not the top. 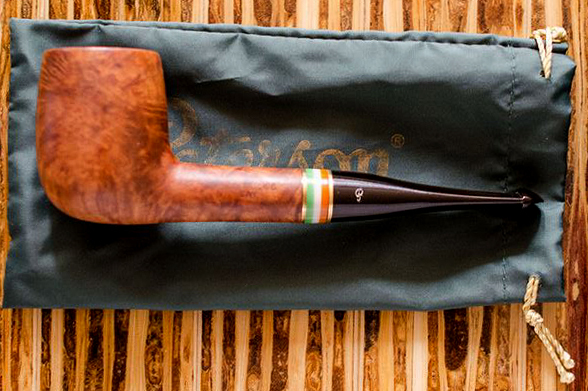 For the straight pipes, the effect is especially nice, since it makes them into rocking “setters”—setter being the name K&P has traditionally called any pipe that will sit by itself. So what about their smoking qualities? The first thing I noticed was that the pre-carb seems to be a little lighter, a little thinner this year, which means the pipes should break in faster. As some of my acquaintances know, I hold the record in Guinness for number of burn-outs, so I’m a believer in pre-carb. Among other things, pre-carb also means (unfortunately) more moisture in the smoke until its burned in. But even if it takes me a few extra bowls to know whether I’ve got what Fred Hanna calls a piece of “magic briar,” for me its worth it. 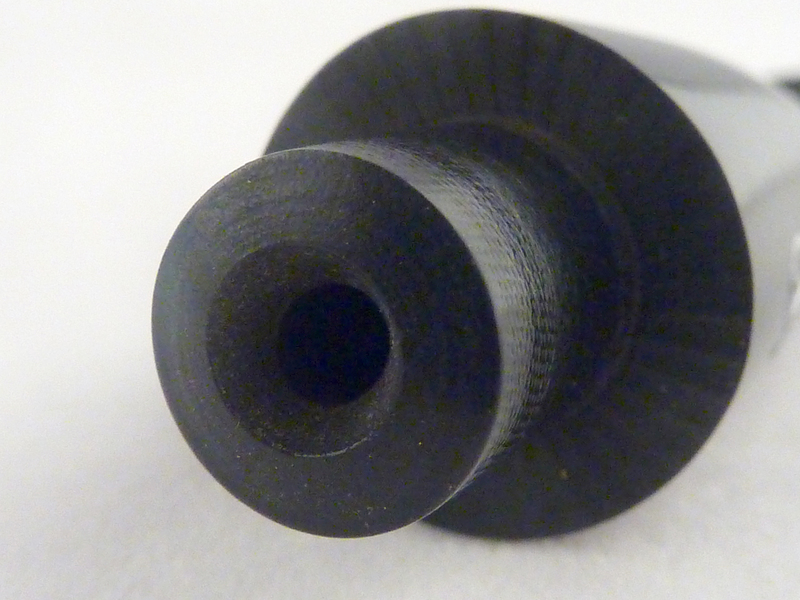 Most non-Pete users would be amazed to know just how good the mouthpieces are on a $100 Classic Lines Peterson pipe—I would stack them up to almost anyone’s, artisan or factory-made. They’re got a nice, deep “V” air slot at the button, and the tenon’s air passage is chamfered, giving the smoker a very smooth, open draw. 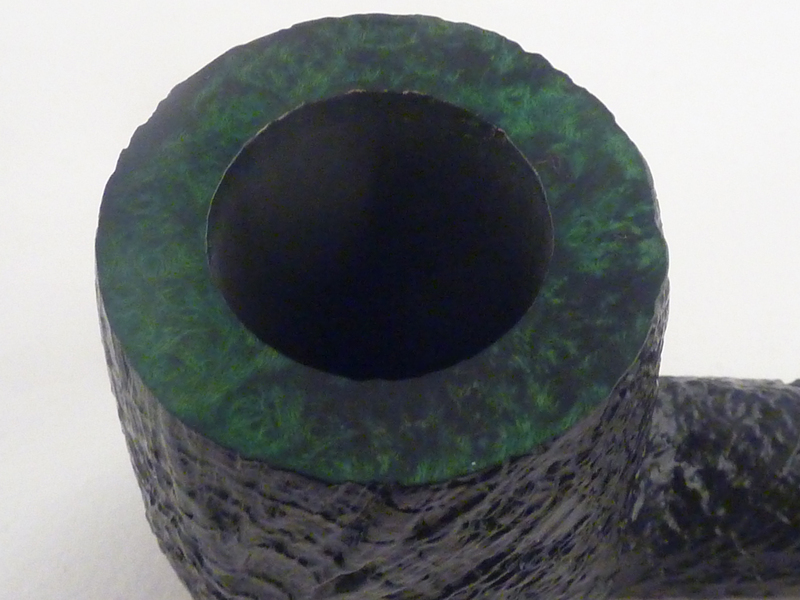 You’ll also hear people cavil about pipes with ebony or lacquered finishes, saying they heat up and don’t allow the wood to breathe. I’ve certainly had some hot pipes in my day (and some of them stained—not lacquered—Petes), but I’m of the school that believes it has to do with the wood itself being insufficiently cured and not because of a lacquer finish. 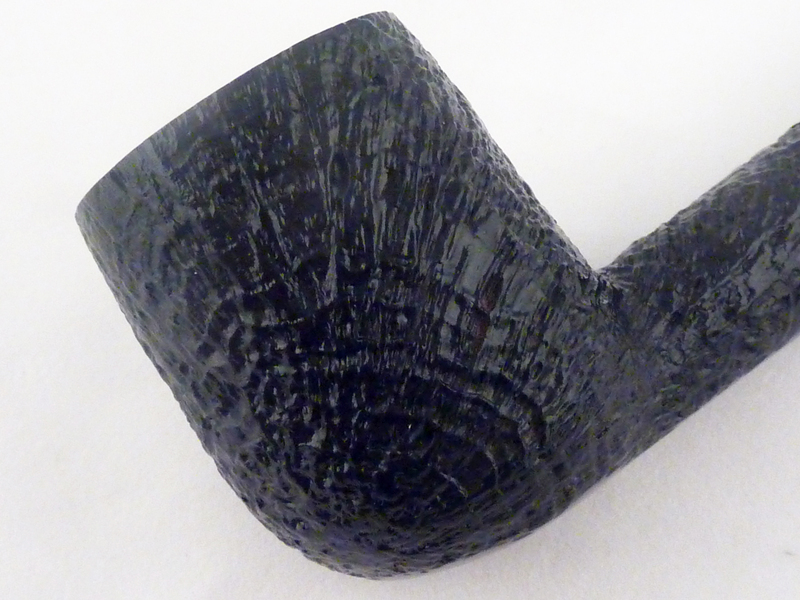 The 106 pictured in this blog has certainly shown no signs of being unduly hot at any point—if anything, it has seemed as cool to the touch as any of my stained/smooth Petes under the similar strain of my chuffing way of smoking. Non-Pete users also like to talk about the gap between tenon and mortise. For System-users, of course, such talk is meaningless. Spigot fans likewise know there will be space by design in the mortise. In the Classic Lines Peterson pipes, there has always been some space here (it’s on a Supreme 106s I have, although the stem’s tenon is designed differently). I can’t say I’ve noticed it’s a problem in the 106 St. Paddy I’ve been smoking for the past few weeks, and can’t remember anyone complaining about it. In any event, my 106 passed “the pipe cleaner test,” the mortise and tenon air holes being perfectly aligned. *(S) as most Pete Nuts know, stands for saddle stem, as in 9s, 11s, etc. The (B) is a designation dating from Charles Peterson’s day, which only gradually died out, and stands for tapered stem—the type of stem found on the Mark Twain Commemorative. Great article! Can’t wait for the book! Great piece Mark, thanks for the good writeup. This is one that I had not thought of looking at before. Now I will.